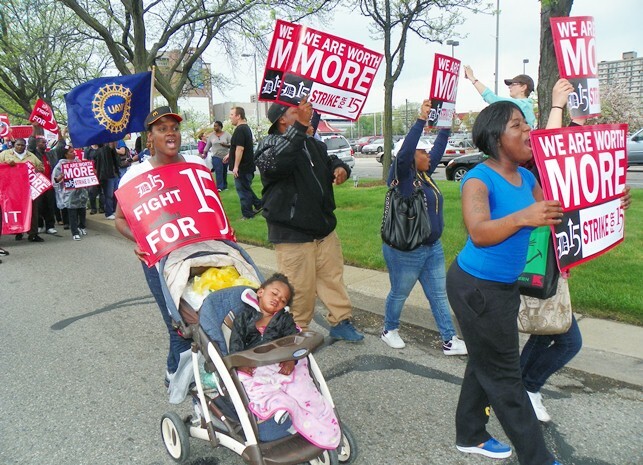 Detroit fast food workers struck and marched last year. Workers across the country are tweeting for strike. America’s fast food workers are planning their biggest strike to date this Thursday, with a nationwide walkout in protest at low wages and poor healthcare. 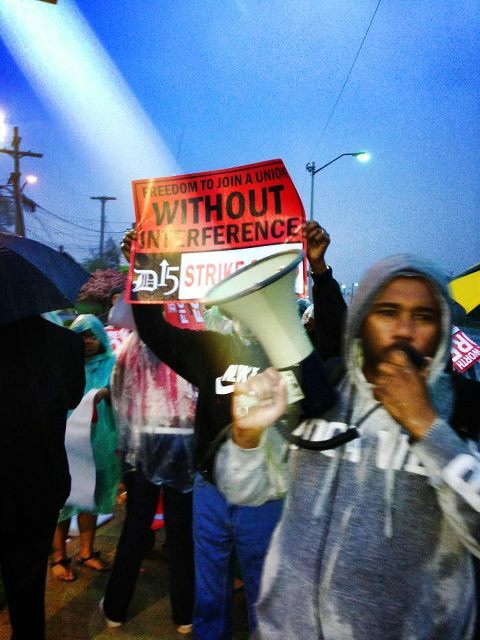 The strike is the latest in a series of increasingly heated confrontations between fast food firms and their workers. Pressure is also mounting on McDonald’s, the largest fast food company, over its relations with its workers and franchisees. Workers from McDonald’s, Burger King, Pizza Hut and other large chains will strike on Thursday and are planning protests outside stores nationwide, in states including California, Missouri, Wisconsin and New York. 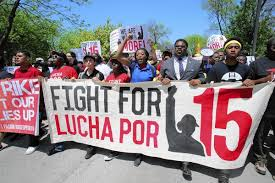 The day of disruption is being coordinated by local coalitions and Fast Food Forward and Fight for 15, union-backed pressure groups which have called for the raising of the minimum wage to $15 an hour for the nation’s four million fast-food workers. 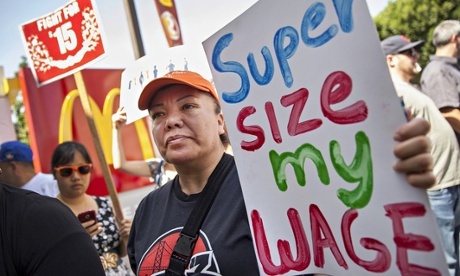 McDonald’s workers demand supersize of wages. Dana Wittman, 38, works for Pizza Hut in Kansas City, Missouri, and will join the strike on Thursday. She makes $9 an hour working night shifts and said she takes home about $600 a week. Her rent is $650 and she is reliant on government subsidies to make up the shortfall. Last month her electricity was cut off for a week when she could not pay the bill. Wittman was recently promoted from chef to shift leader and given a raise from $7.50. Her new responsibilities include organising deliveries, customer service, paperwork and making sure the restaurant is cleaned up and closed down at the end of her shift, which can be as late as 2am. “The company should pay me more. I am worth more,” she said. “They make billions a year and I don’t even get health insurance. The CEO gets health insurance. Workers march at Chicago convention. 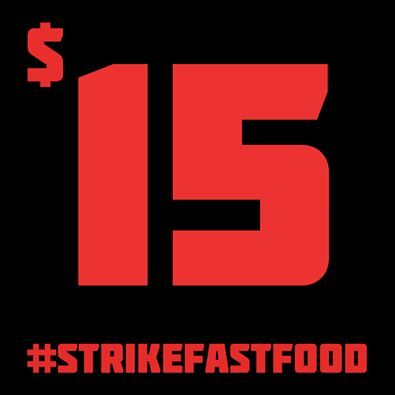 Thursday’s strike will be the seventh since fast food workers in New York walked out on their jobs in November 2012. Each walkout has been bigger than the last and have been credited with spurring President Barack Obama to focus on an increase in the minimum wage. In July more than 1,300 low-wage employees gathered in Chicago, at a convention to coordinate their calls for higher wages and better working conditions. The convention, held a few miles from McDonald’s headquarters, was organised by Service Employees International Union (SEIU), one of the US’s largest unions with two million members. SEIU’s traditional base has been hospital workers, home care aides and janitors but it has become increasingly focused on recruiting food service workers. At the convention, the workers voted to intensify their efforts for higher pay and union membership by using nonviolent civil disobedience. Rally organisers declined to comment on their plans for Thursday. Workers strike in early morning hours. Terrence Wise, a Burger King worker, member of Stand up KC, and member of the national organizing committee of Fight for 15, said: “Thirteen-hundred workers unanimously adopted a resolution at our convention in July to do whatever it takes to win $15 an hour and union rights, including participating in non-violent, peaceful protests in the tradition of the civil rights movement. The rally comes after the National Labor Relations Board defined McDonald’s as a joint employer of the restaurants run by its franchisees. The decision came after the SEIU brought several cases against the company, alleging it acted as an employer. The decision, which is being heavily challenged, could bring McDonald’s to the negotiation table over wages and benefits. The company has insisted, and continues to insist, that its franchisees, not the corporation, are responsible for wages. Should the NLRB’s decision be ratified, SEIU would be able to unionise McDonald’s operations on a larger scale, rather than targeting a few franchises at a time. 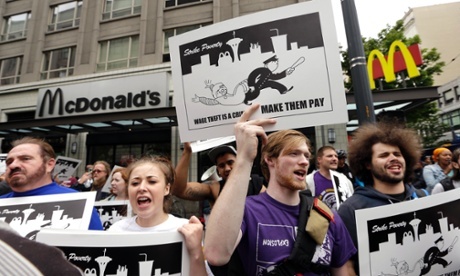 In this Aug. 1, 2013 photo, demonstrators protesting what they say are low wages and improper treatment for fast-food workers stand near a McDonald’s restaurant in downtown Seattle.